Buying for a baby shower gift can sometimes be so stressful. I know the last baby shower I went to I had such a hard time finding something. I wanted to make sure that what I got was cute but also practical. That is why I think that the Playtime Gift Pack Set from Playgro is a wonderful baby shower gift. It comes with toys that are cute but they also are practical for the baby’s first couple of years. *I got the product listed below from Playgro in exchange for my honest opinion. 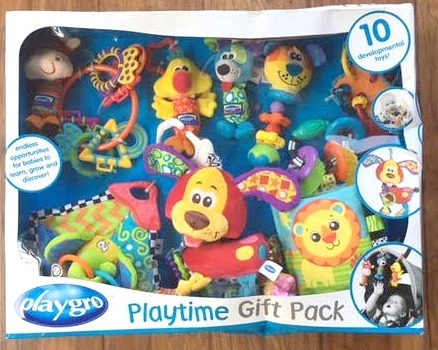 There are 10 toys included in the Playtime Gift Pack. All of the toys are made for the purpose of helping babies developmentally. The colors are vibrant and fun. The toys make noise and there are different textures for the baby to explore. While going through the box of toys I was able to group them into three types of toys. 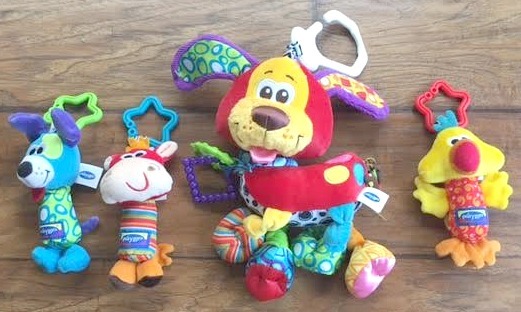 The first set of toys are the crinkles. A little silly but both of these toys are “crinkly” so I grouped them together as the crinkle toys. The toy on the left makes noises when “crinkled”, has a corner for teething and fun rings for more developmental fun. The toy on the right is a soft tag book. Babies love tag books and they will love this bright colored crinkle tag book full of fun animals. The second group of toys were the car seat toys. This group included four toys. They are all toys that can be hung from the top of a car seat. This is great because your baby will have plenty to do whenever they may have to be stuck in their seat, which I know my kids hated but was always made better with a reachable toy. This also allows for the toy to stay close to your baby without it falling to the floor of the car, which could help prevent tantrums. 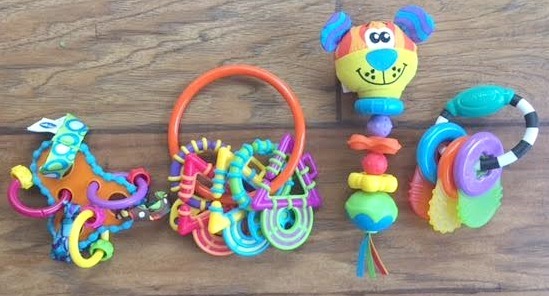 Some of these toys rattle and they have different textures, colors and sounds. The last set of toys are teethers. Teething is such a fun stage, am I right? NOT! Teething can be so rough on both the child and the parents. With teething toys, part of that struggle can be lifted away. These four teething toys provide a baby with different options and a great array of colors and textures to experience. So the next baby shower you go to look no further because the Playgro Playtime Gift Pack is a perfect gift for that soon to be little one (boy or girl)! Who do you know that is having a baby soon? What is your favorite part about the Playtime Gift Pack?